On April 22, 1911, aviation pioneer Charles Hamilton crashed his brand new, all white, biplane the “Moth” at Andrews Field in New Britain. Hamilton, a New Britain native, began his career in aviation at the age of 18 as a hot-air balloonist and parachute jumper under an assumed name, H. A. Milton. Hamilton became one of the most daring parachutists of the time and traveled the world demonstrating small dirigibles. He was the first to introduce dirigible flight to Japan in 1908. After learning to fly aeroplanes Hamilton joined an exhibition team, The Curtiss Aviators, where he earned the nick name “Demon of the Skies” from the press for his vertical “Dive of Death.” His popularity as a daredevil opened up numerous opportunities and he crisscrossed the country as a professional exhibition pilot. At the time enormous cash prizes were offered by some of the country’s largest newspapers—which were only too willing to capitalize on the public’s fascination with flight. In June of 1910, Hamilton shattered aviation records winning a $10,000 cash prize from The New York Times and The Philadelphia Public Ledger. After leaving The Curtiss Aviators, Hamilton worked as a freelance pilot before forming his own business in April of 1911, the Hamilton Aviation Company, for the purpose of “manufacturing, exhibiting, selling and buying aeroplanes.” The company immediately ordered a Burgess-Wright biplane which arrived by train on April 20. The plane was assembled the next day at Andrews Field in the Stanley Quarter of New Britain. The buzz around town about Hamilton’s new venture was widespread as the plane had arrived on one of the railroad sidings near the Stanley Rule & Level Company, one of New Britain’s largest employers. The first flight was scheduled for Sunday afternoon, April 22, and crowds of thousands gathered and waited around all day for a glimpse of Hamilton. But strong winds prevailed and it wasn’t until 6:30 pm that Hamilton finally took off. The crowds had thinned at this point but those who remained witnessed Hamilton rising to about 100 feet and traveling about a half mile before the plane suddenly swerved to one side and crashed. Hamilton who had just recently recuperated from a serious crash at the California State Fair in Sacramento in September, and an illness after a brief stint in a Mexican jail in March, suffered only a small cut to his head. 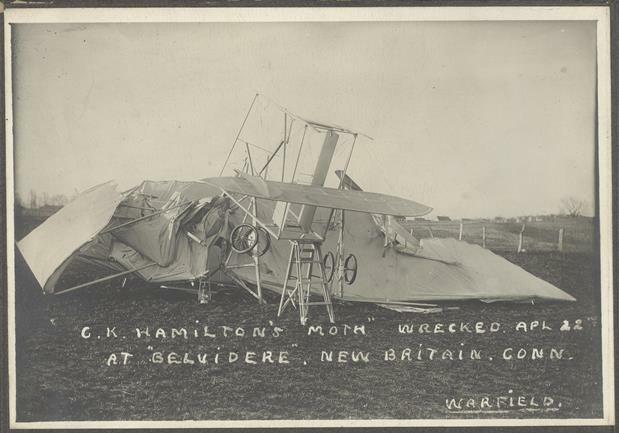 “Hamilton’s New Aeroplane Wrecked: Crashes to Ground After Short Flight, but Aviator Escapes Serious Injury Initial Trial of Machine in New Britain Bird Man Caught in Debris and Extricated with Difficulty--Gets Only Slight Cut.” Hartford Courant. April 24, 1911, sec. ProQuest - Hartford Courant Historical Newspaper database - Available through iCONN.org. “New Britain to Be Aviation Center: C K. Hamilton Organizes Company and Brings in Baby Hamilton Biplane.” Hartford Courant. April 21, 1911, sec. ProQuest - Hartford Courant Historical Newspaper database - Available through iCONN.org.